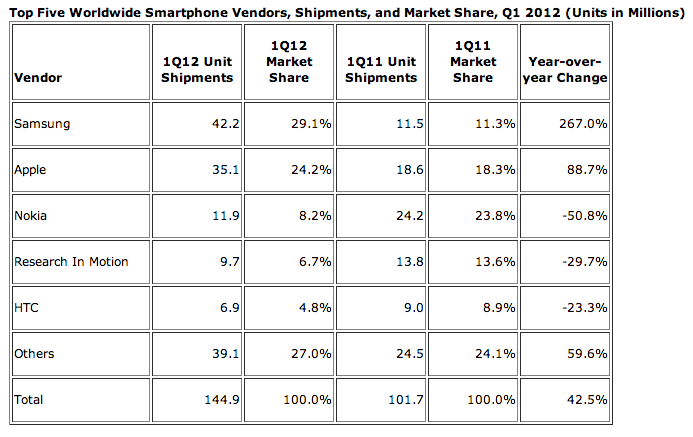 IDC is the first of the big analyst companies to come out with quarterly mobile device shipment numbers that indicate Q1 as the first quarter where smartphones have outnumbered more basic feature phones in worldwide shipments: in a total market of 418.6 million devices, 216.2 (51.6%) were smartphones. But it is was a kind of tipping point of another sort, too: it is a sign of how Apple is not the juggernaut that it once was. Samsung shipped nearly 71 million smartphones in the quarter, giving it a market share of almost one-third of the whole of the smartphone sector (32.7%). 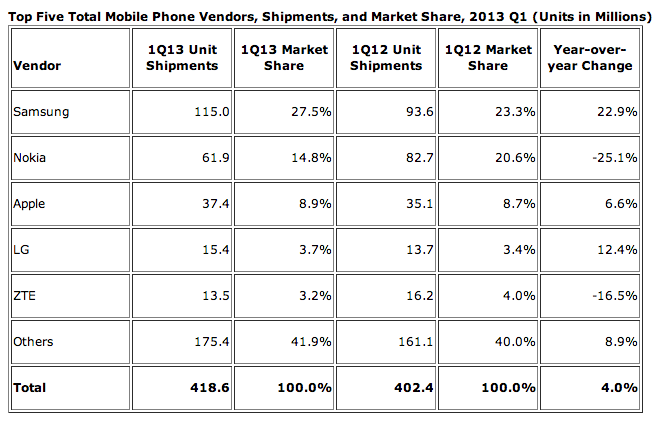 Apple, meanwhile, shipped 37 million devices — just over half as many as Samsung, for a market share of 17.3%. With all others in the top-five — LG, Huawei and ZTE — still with less than 5% market share apiece, Samsung and Apple remain a strong top-two. It’s notable that Nokia, BlackBerry, and HTC whose shipments were on the decline last year but still enough to keep them in the top-five, are now out of the picture altogether. It also shows that Nokia’s sub-10 million sales of smartphones, with 5.6 million Lumias, are not big enough figures to break out of the sizeable ‘others’ category. IDC notes that LG, which shipped 10.3 million smartphones in the quarter, a rise of over 110% over the year before, was helped by three factors in the last quarter. The first of these was the popularity of the Nexus 4 device it created with Google; the second was the success of its lower-priced L Series (15 million sold in this category alone since launched); and the third was its LTE line. These three point to how those Android handset makers that can create strong enough and distinctive handsets that are set apart from the rest of the Android crowd can continue to pull away from the crowd. Apple’s iPhone brand has never been seen as anything other than premium, and true to type, it is still not playing at the same level as others smartphone industry in creating new models that aim at the “cheap smartphone” market. CEO Tim Cook did not discuss the prospect of a new, low-cost device, on Apple’s earnings call this week — the focus remains on selling older models, namely the iPhone 4, in markets like China as a route to bringing new smartphone users on to the platform. Other handset makers like Samsung, Nokia and many “others” are building out portfolios that hit not only at high-end users but those looking for entry devices priced at closer to $100 or even less. 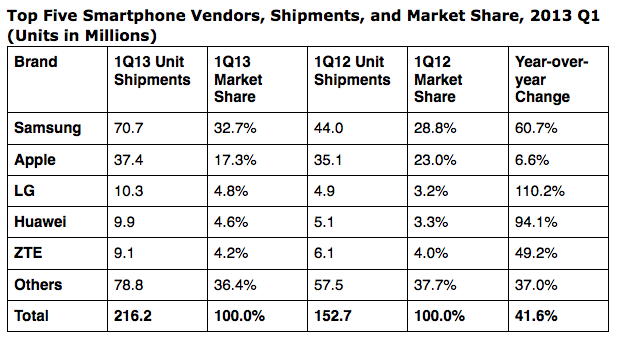 Some handset makers, specifically in emerging markets, are targeting only this market. On the other hand Cook also left open the possibility that whatever comes next may be something different altogether: the “really great stuff” coming out in the autumn and in 2014 could be another iPhone. Equally, it could be something else altogether, and not a handset at all.